Trimble Dimensions, the 2012 International User Conference, will take place at the Mirage Hotel in Las Vegas, Nevada from November 5 to 7. Early-bird pricing has been extended to September 14. 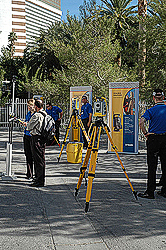 The annual event targets surveying, engineering, construction, mapping, GIS, geospatial, infrastructure, utilities and field service management professionals who use positioning products developed and sold by Trimble companies. The companies include: Accubid, Applanix, Meridian Systems, OmniStar, Pacific Crest, PeopleNet, Plancal, QuickPen and Tekla. The two day conference features technical sessions, networking, offsite demonstrations and training and an exhibition of Trimble and partner company products and applications. Trimble holds 900 U.S. and other patents, most of which cover GPS technology and other applications such as optical and laser technology.